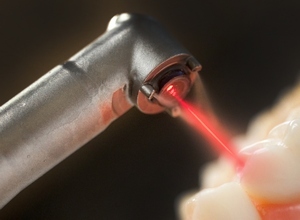 Laser SoftCare is a laser based technique for the treatment of periodontal disease using the Lares PowerLase™ Laser. Fear of periodontal treatment vanishes when patients find out no scalpel or sutures will be used. Patient friendly laser treatment gets patients to agree to the treatment they need and continue with the follow-up care that is prescribed. Our office is one of the first in the area to offer Laser SoftCare for the treatment of gingivitis and/or periodontitis. Following are commonly asked questions about this technology. Initial treatment is focused on scaling and the use of small instruments to remove the tartar. Then, the laser portion of the treatment is performed and normally only takes a few minutes. Depending on the severity of the patient’s periodontal disease, treatment may be accomplished in one office visit or in multiple visits. The estima ted treatment time is reviewed with patients when we discuss their treatment plan. The dramatically increased comfort for our patients made the new system attractive to our office.